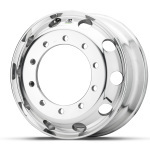 "Since inventing the forged aluminum wheel, Alcoa has continuously innovated stronger, lighter, and more durable wheels to increase payload and enhance sustainability"
NEW YORK & SZÉKESFEHÉRVÁR, Hungary--(BUSINESS WIRE)--Alcoa (NYSE:AA), the inventor and global leader of forged aluminum wheels, has rolled out its most durable, easy-to-maintain commercial truck wheel. Alcoa’s new surface-treated Dura-Bright® EVO wheel maintains all the benefits of its predecessor, the Dura-Bright® wheel with XBR® technology, while taking the wheel’s performance to a new level. The Dura-Bright EVO wheel is 10 times more resistant to corrosion primarily caused by road salts and weather elements. In addition, the wheel is up to three times more resistant to chemicals, including hydrofluoric acid, found in the toughest truck wash cleaning agents. This enables the use of a wider variety of cleaning solutions to simplify maintenance, while preserving the integrity and brightness of the wheel. The Dura-Bright EVO wheel is now commercially available in Europe, where the Company has already seen significant adoption of its Dura-Bright wheels. Alcoa has begun producing the wheel at its manufacturing plant in Székesfehérvár, Hungary. The wheel is expected to be available in all other markets in 2015. “Demand for Alcoa’s aluminum wheels continues to grow in Europe, as emissions regulations and maintenance costs drive up the need for stronger, lighter and easier-to-maintain wheels that increase payload, reduce costs and enhance sustainability,” said Scott Kerns, Vice President and General Manager Commercial Vehicle Wheels Europe, Japan and South Africa. Unlike competitive surface coatings that can crack, peel, corrode and dull quickly, the Dura-Bright wheel allows brilliant shine to last even after years of use, without the need for polishing. Dura-Bright is not a coating, but rather a surface treatment that penetrates the aluminum and becomes an integral part of the wheel. Regular cleaning with commonly used truck cleaning products or with just soap and water will keep the wheels shiny, even after hundreds of washes and thousands of kilometers, reducing maintenance costs. In addition, Alcoa’s wheels are made from one piece of forged aluminum, making them lighter and five times stronger than steel wheels, increasing payload and fuel efficiency. Alcoa’s surface treatment experts at the Alcoa Technical Center, the world’s largest light metals research and development center based outside of Pittsburgh, PA, developed the Dura-Bright wheel technology in collaboration with the Alcoa Wheel and Transportation Products business. The Company launched the first Dura-Bright product in 2003. Three years later, Alcoa’s experts improved the brightness and corrosion performance of the Dura-Bright treatment and introduced Dura-Bright wheels with XBR technology. Alcoa’s scientists have now enhanced the patented Dura-Bright technology with the development of Dura-Bright EVO wheels. Alcoa has been innovating surface treatment and coating technologies for the past 40 years. Beyond Dura-Bright wheels, Alcoa has produced products that have opened market applications across industries, from surface treatments that enable adhesive bonding for aerospace structures and structural joining for automotive applications, to anodization and coating technologies for durable, sustainable building and construction materials and aesthetic treatments for consumer electronic devices. Alcoa Wheel and Transportation Products, headquartered in Cleveland, Ohio, is part of Alcoa’s downstream business, Engineered Products and Solutions. 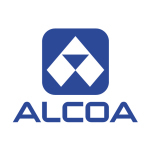 In the first three quarters of 2013, Alcoa’s value-add businesses, comprising Engineered Products and Solutions and Global Rolled Products, accounted for 57 percent of Alcoa's total revenues and 79 percent of segment after-tax operating income (ATOI). Alcoa Wheel and Transportation Products serves the commercial vehicle, automotive, and defense markets with products used in a range of applications including forged aluminum wheels, premium products such as Dura-Bright®, Dura-Flange®, LvL ONE® and M-Series™ medium duty truck wheels, as well as a variety of other aluminum components for these markets. Alcoa has been the forged aluminum wheel leader since inventing the product in 1948. AWTP is composed of three divisions: Commercial Vehicle Wheels, Forged Specialty Wheels and Transportation Products. It employs 1,500 people at 13 locations worldwide. More information can be found at www.alcoawheels.com. Follow @AlcoaWheels on Twitter at twitter.com/AlcoaWheels. Alcoa Wheel Products Europe is headquartered in Székesfehérvár, Hungary, and employs 394 associates in 2 European locations: the manufacturing facility in Székesfehérvár and the service and distribution centre in Paal, Belgium. 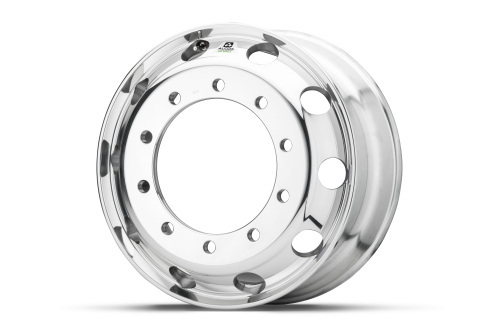 They manufacture forged aluminium wheels for trucks, trailers and buses. For more information on Alcoa wheels, go to http://www.alcoa.com/alcoawheels/europe/en/home.asp.